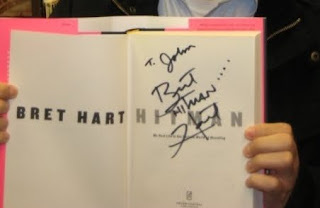 Bret "Hitman" Hart's book tour rolled into Boston yesterday and I lined right up with a couple of hundred people to meet one of my wrestling heroes. My impressions of Bret in the brief minute I spoke to him while he signed my copy of "Hitman: My Life in the Cartoon World of Wrestling" were that he was certainly older now. Everything that has happened to Bret in the last ten years, losing his brother Owen, his parents, his brother in law Davey Boy Smith, his marriage, his stroke, has taken its toll. His long stringy hair is now greying brown, no longer the slick greasy black of his heyday. There are more lines on his face than before, and that face is tinged with sadness and loss. The T-shirt he wore of himself and Owen in happier days of the early 90's was a bittersweet reminder of that. And yet, he's still Bret Hart. Bret seemed reserved and taciturn, but still carries himself with a bit of that trademark arrogance that helped define "the Hitman". A little intimidating at first glace, it turned out Bret was gracious, good humored, and occasionally showed that world-famous smirk of his. I was thrilled to meet him. While in line with my friend Lance Jr., I cracked numerous jokes to temper the building excitement, but I was honestly nervous to meet Bret. When I was about 17, around the time Bret was WWF Champion for the first time, he was my hero. Bret still holds my highest regards for his career and accomplishments. I hoped I'd be funny and cool, maybe say something clever to Bret when I finally got to the table and shook his hand but no, I just about totally marked out. Just blathered about what a big fan I was and how I thought his book is fantastic. It was maybe a minute of interaction but it felt like it was a microsecond. About Bret's book: This is the real deal. Only 184 pages in, I can already honestly say "Hitman" is as good as Mick Foley's "Have A Nice Day"; perhaps in some ways even better. This is lofty praise. Bret's book and Foley's first book are the highest level of pro-wrestler autobiographies. Chris Jericho's "A Lion's Tale" and I think to a lesser extent Edge's "Adam Copeland on Edge" are in the second tier but below what Foley and Bret have written. Every other wrestling biography is crap, crap, crap of varying shades. A fan of pro wrestling, especially someone who craves an insightful, blunt, and intelligent account of the Calgary Stampede Wrestling era of the 1970's, and the World Wrestling Federation of the 1980's and 1990's, along with stories about working in Japan and the territories in the early 80's and WCW leading to its collapse, would gladly devour Bret's book. Bret pulls no punches; he is brutally honest, funny, touching, sad, and impressive. I'm glad to say Bret's autobiography is the equivalent of his wrestling talent. It's the excellence of execution.